Hi, I am interested in your 1982 Jeep CJ 7 (stock #1141-NSH) listed on Autotrader for $18,995. I'd like to get more information about this vehicle and confirm its availability. Do you ever want to go explore the road less traveled? Head down a dirt road out in the woods, or explore the outer reaches of a park system, and yet need a nice driving vehicle to get you around town or to work until you can get away? Then this CJ7 might be the vehicle you need. It can take you to work during the week, and take you as far away from it as possible on the weekend. This is one sharp looking Jeep in its glossy Black paint and proudly proclaims itself as a Renegade in silver script on the hood. Silver stripes also grace the nose of the hood and run along the rocker panels, and Jeep is highlighted in silver on the tailgate. There is plenty of chrome dressing up the CJ too. It starts up front with a chrome grill and headlight bezels along with a push bar bumper with driving lights mounted under the protective hoop and additionally protected by their own brush guards. A bar along the rockers has a rubber step pad to assist in getting up and inside and there is another stout chrome bumper out back with a trailer receiver built in. A few extra splashes of chrome appear on the hinges and side mirrors and a brand new Bestop bikini top offers some protection from the sun and the rain. Step up inside and you will find a nicely redone Gray interior. It is super clean looking with a stainless dashboard under the black upper dash pad. In usual Jeep fashion, everything except for the headlight switch is mounted in the center. There is a row of switches for the wipers and ventilation system along the left side and six white faced Autometer gauges for the speedo, tach, oil pressure, water temp, voltage and fuel gauge off to the right with an Alpine FM/CD player mounted under them for your listening pleasure. The high back bucket seats have been reupholstered with Bestop seat covers. There is a nice lockable center console with a padded armrest and cup holders, and the passenger side gets a chrome grab handle. Padded roll bars not only look good but will be appreciated by your back-seat passengers who also get their own cup holders at the back of the console and newer carpeting throughout keeps things comfortable. Pop the hood on this Jeep and you will find a completely stock, tried and true, 258 in line 6-cylinder engine. While this Jeep is capable of taking you about anywhere you want to go, its obvious that this one has seen primarily road duty. There are signs of good routine maintenance of the belts, hoses and tune up items as well as a new battery and master cylinder. Even the flex duct directing air to the filter housing is in great condition. The power it makes is sent back through a 4-speed manual transmission and transfer case and also in tried and true Jeep fashion, is sent to solid axles front and rear mounted on leaf springs. Front disc brakes and power steering assure good stopping ability as well as easy maneuverability and the rubber meets the road through 31X10.50R15LT Goodyear Wrangler tires mounted on steel, alloy style wheels. 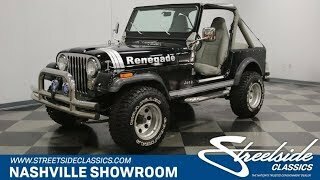 A stylish around town CJ7 Renegade that can get you out of town and as far away from work as you wish on the weekends. Come on down and check it out.